James has been a part of the Archaeology Wales team for two years and is currently an Assistant Supervisor. He has taken part in two major projects, Newport, which covered a large range of multiphase archaeology, and EAOne Ipswich, where he was involved in a number of complex sites. 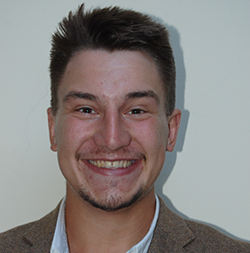 He is based in the office in Caerphilly and has lived locally since finishing his studies at Cardiff University. As a part of his studies, James took part in both foreign and domestic excavations, in Hungary, Serbia and Wales. He also worked as a student supervisor on the CAERAU hillfort project. James is especially interested in multiphase archaeology and landscapes. He has recently started AW’s Supervisor Training Program.